Emotions are at the very heart of individual and communal actions. They influence our social and interpersonal behaviour and affect our perspectives on culture, history, politics, and morality. 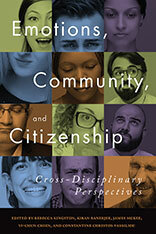 Emotions, Community, and Citizenship is a pioneering work that brings together scholars from an array of disciplines in order to challenge and unite the disciplinary divides in the study of emotions. These carefully selected studies highlight how emotions are studied within various disciplines with particular attention to the divide between naturalistic and interpretive approaches. The editors of this volume have provided a nuanced and insightful introduction and conclusion which provide not only an overarching commentary but a framework for the interdisciplinary approach to emotion studies.